Carpe Diem! Seize the Day! Make Your Lives Extraordinary! It just so happened that when I opened my Facebook this morning, the first piece of news that I read was the death of Robin Williams. Initially I thought it was a hoax (some bo Liao people start death hoaxes about celebrities all the time) and I googled about it. To my dismay, the major news channels were reporting it. “The world has lost a great actor” was the headlines of most news articles (with slight variations). I grew up with Robin Williams’ movies. It was during my “age of freedom” (the beginning of the time when parental approval was freely given to go out with my friends) so I watched a lot of movies and that was the peak of Robin Williams’ acting career. As a result, I watched a lot of his movies, from comedies to inspirational ones. My favourite Robin Williams’ movie would have to be “Dead Poets Society”. I love his rousing performance as John Keatings who inspired his students to think, to feel, to live! Perhaps it was because I could identify with the impressionable youths as I was one myself at that time. It was exhilarating to see a literature teacher being so unconventional (I was petrified by my very fierce English teacher at that time. I hope she’s not reading this…). It also helped a lot that the movie had some really good looking actors. I was quite enamoured with Ethan Hawke at that time. Although when I watched the movie again as an adult, I felt that he was not being totally responsible by being too extreme. 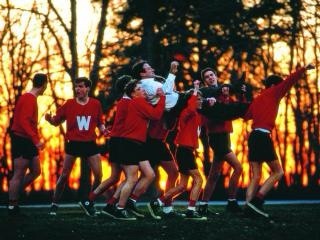 Nevertheless, the movie was inspiring enough that vivid scenes reappear in my mind at the mention of Robin Williams or Dead Poets Society. That is, perhaps, one of the greatest gifts that Robin Williams has given me. I call it – standing on the table scene. “Why do I stand up here? Anybody? I stand upon my desk to remind myself that we must constantly look at things in a different way.” It’s almost as synonymous as Scout Finch “To kill a mockingbird” to wear that person’s shoes and walk around in it. And the final scene when all the boys started standing on the desks one by one, as John Keatings was leaving the school. That was indeed a moment of courage and gratitude. Thank you Robin Williams for delivering the lessons of life through your movies. Rest in Peace.